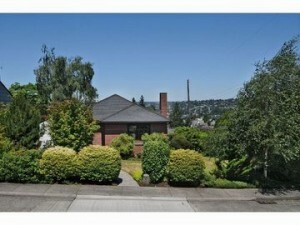 Looking for an absolute gem on a spacious corner lot with expansive views and sundrenched rooms? You’ve just found it in this immaculate and lovingly cared for brick bungalow boasting not only fantastic street appeal but once inside, you’ll know you’re home. The warmth of glistening hardwood floors and a gas fireplace in the living room and ding rooms embrace you. Perched on the NE corner of the home is the delightfully remodeled kitchen with its’cool Italian tiled floors, new granite countertops, newer appliances, all of which opens to spectacular views from the entertainment sized deck towards the Cascades. Two lovely bedrooms, are on the main floor, one of which opens to the deck. The main floor bath is absolutely magnificent, remodeled to the studs in 2007. Below is an ideal rec room area, a fantastic 3rd bedroom and new 3/4 bath (freshly recarpeted and painted). Add plenty of storage, ideal utility room and workshop. Enjoy a carport + 2 parking pads. Add to that a new waterline to the street, brand new wood windows throughout, new water heater, new deck/railing, new 50 yr roof, and new high efficiency furnace and gas fireplace. Easy to care for landscaping and a newly built retaining wall on the West side. An ideal opportunity to move right in and call this perfect gem – home!